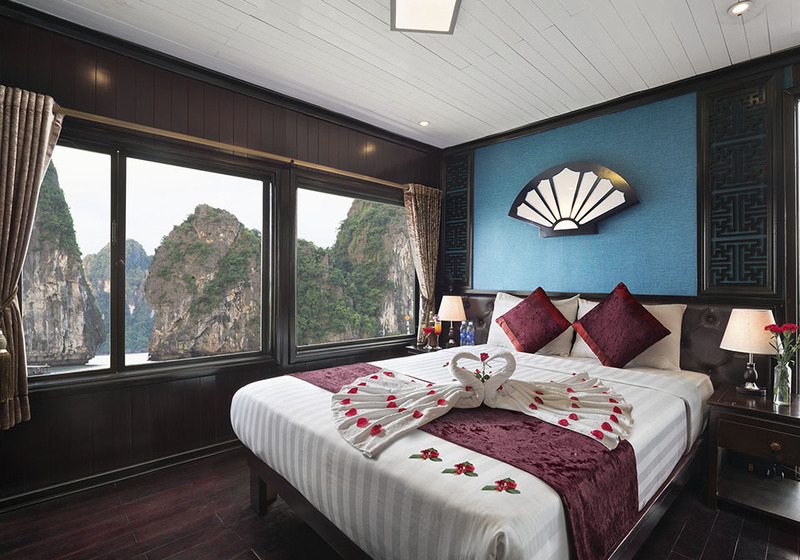 12:00: Arrive Got Ferry Terminal, transfer by tender to La Paci Cruise, and enjoy welcome drinks, receive cruise briefing, safety instructions then check in to your cabin and set sail through Halong Bay while having time to admire the magical landscape go by. The Cruise Pass Da Chong Islet, where you can see a light house built by the French over 100 years ago. 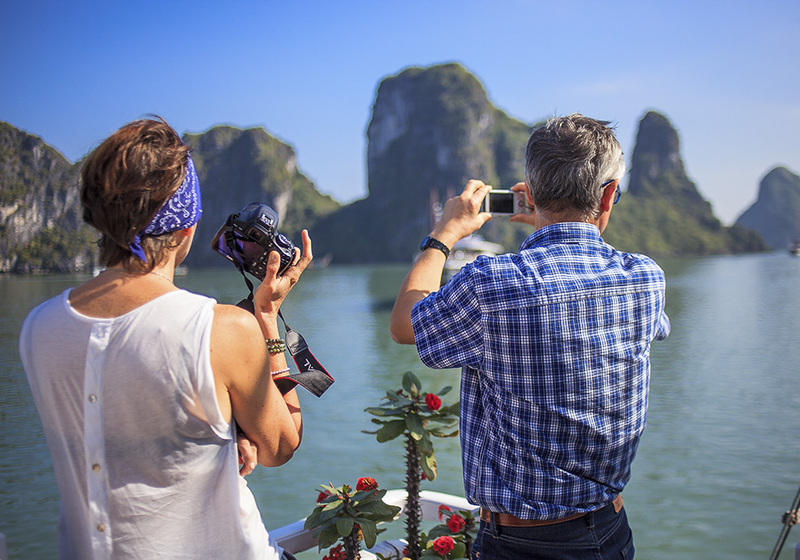 13:00: A special lunch in Vietnamese cuisine of fresh seafood and an assortment of appetizing favorites are served while sailing through Islets of Con Vit and Gia Luan. 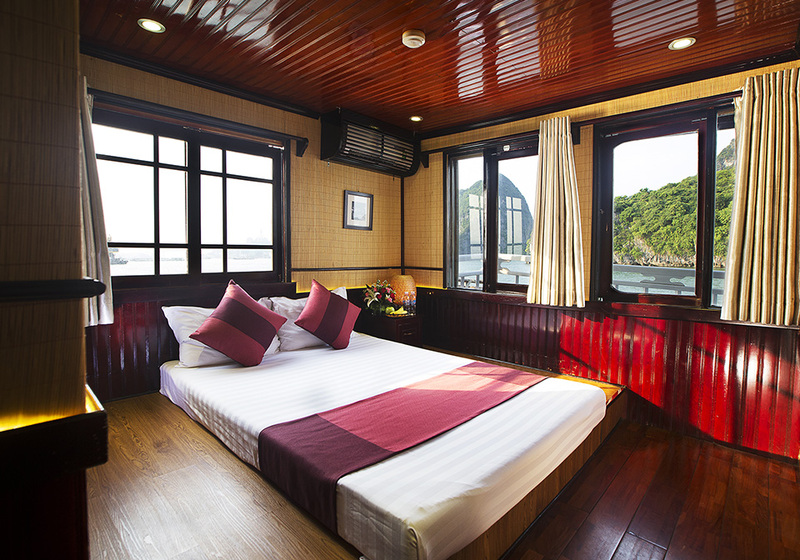 16:00: The Cruise sails through Lan Ha Bay and completes its entry through Cua Van Area. The area is surrounding of extraordinary limestone karsts landscapes. From June to September: We progress to Tra Bau area of Lan Ha Bay- a separate part of Halong Bay. This is a quiet tourist paradise in Vietnam, enjoy kayaking and/or enjoy swimming in the crystal clear waters of the Bay. 17:30: Back to La Paci Cruise, drop anchor for staying overnight. 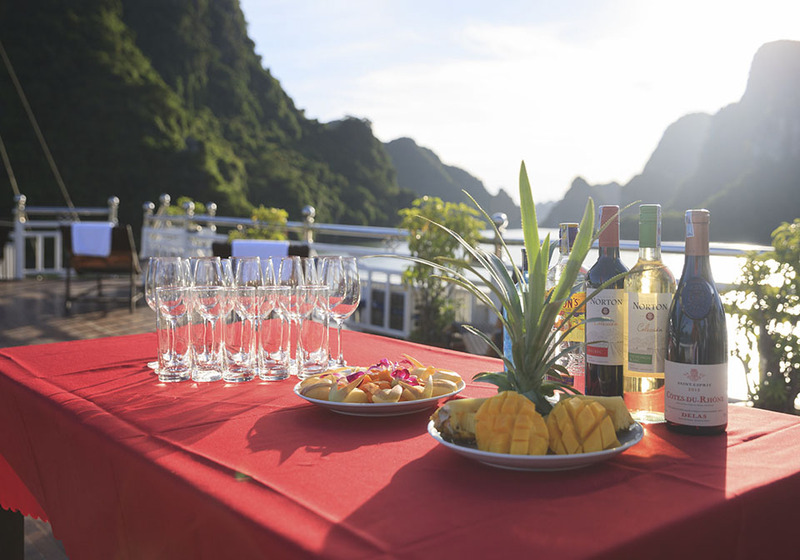 Enjoy the complimentary sunset party on the sundeck with local wine and fresh fruits. 18:30: Join cooking class demonstration (teaching you how to make our speciality, Spring rolls) on the cruise. 19:00: Dinner is served in the restaurant. Enjoy delicious local food prepared and served for you by our wonderful onboard catering staff. 21:30: Retire to your cabin or join the fishing excursion, watch a movie, have a drink at the bar, internet access or play exciting games. Overnight on board. 06:00: Enjoy sunrise and admire the never ending miraculous scenery of the Bay. Practice an invigorating Tai Chi session on the sundeck. F.O.C for one child below the age of 4 years traveling with two adults, sharing bed with 2adults. Limited one child per cabin only. 07:00: Light breakfast, coffee and tea served. 08:30: Transfer to day boat for visit Viet Hai village. You will take the bicycle trip along the village path and go through rain forests and dark tunnel. Enjoy stunning scenery of rice fields on the way. Stop at the village to relax. Visit an ancient local house, made from straw, mud, bamboo, you will have chance to see the local life on a valley of local people. 11:30: Back to day boat for visiting Lan Ha Bay. Lunch served on day boat. 13:30: Visit Lan Ha Bay, free kayaking to discover bay by yourself and swimming in the blue water. From October to May: Visit the Ba Ham Lake area situated in the middle of a narrow, rectangular area, with the all four sides enclosed by vertical cliffs. (if the weather permit). From June to September: Visit the Van Boi area, which is the heart of Lan Ha bay, there are a lot of white sandy and coral beaches. 17:00: Return to La Paci Cruise, time for relax. Enjoy the complimentary sunset party on the sundeck with local wine and fresh fruits. 18:30: Join cooking demonstration (teaching you how to make our speciality, Spring rolls) on the cruise. F.O.C for one child below the age of 4 years traveling with two adults, sharing bed with 2 adults. Limited one child per cabin only.